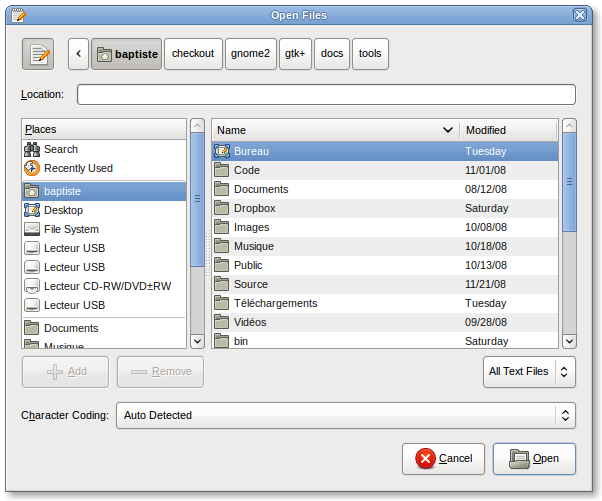 GtkFileChooserDialog is a dialog box suitable for use with "File/Open" or "File/Save as" commands. This widget works by putting a GtkFileChooserWidget inside a GtkDialog. It exposes the GtkFileChooserIface interface, so you can use all of the GtkFileChooser functions on the file chooser dialog as well as those for GtkDialog. gtk_file_chooser_dialog_new_with_backend has been deprecated since version 2.14 and should not be used in newly-written code. Creates a new GtkFileChooserDialog with a specified backend. This is especially useful if you use gtk_file_chooser_set_local_only() to allow non-local files and you use a more expressive vfs, such as gnome-vfs, to load files. The name of the specific filesystem backend to use.